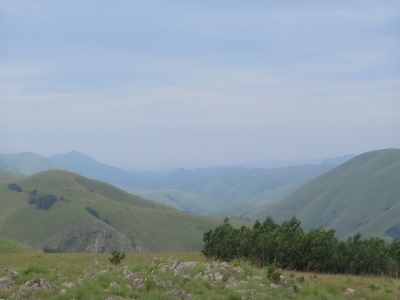 Barberton Makhonjwa Mountains is a range of small mountains best known for having some of the oldest exposed rocks on Earth. The rocks are estimated to be between 3.2 and 3.6 billion years old, dating from the Paleoarchean. Scientists have also found evidence of the largest terrestrial meteor impact event to date near the area. I understand now why there is no buffer zone to this site. Most of the site is on privately owned land and there is no need to protect it with more areas surrounding it. I am actually shocked how this can be listed as WHS but a massive chunk, 20% perhaps, is a private game reserve called Mountainlands. Coming from the Oshoek border crossing I didn't take the 4x4-only path leading to the Genesis Road. I took the long way around and eventually made it into the core zone. The Genesis road leads you along the border towards the Geotrail but don't expect anything aside from bumps and nice views. There is even a lodge village with a security gate but they are happy to let you through. The Geotrail completed in 2014 then continues to Barberton. Along the 38km road are 11 spots to park, read a panel and see the rocks for yourself. Some stops are just lookouts to see the mountains and the valleys. The highlight of these is surely the Lebombo View. Not only is the view fantastic, there is a panel for each different rock as seen at the individual spots, e.g. tidal sandstone. Plus there is a toilet (and it encourages going in the fields)! The area has the oldest most well preserved sequence of volcanic and sedimentary rocks on earth, from time periods 3.2-3.5 billion years ago. 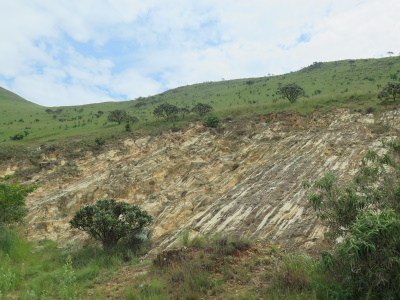 With Vredefort Dome, 20% of South Africa's WHS are currently geology related. Add that to the fossil site, rock paintings and a couple of parks listed for cultural reasons, it makes ZA sound very boring on paper. Of course they are not, but the geology sites rank far behind with the others. I think the geotrail is trying to give us an idea of what happened here before and how. The how is not always easily understood. The rocks may contain artifacts of the oldest creatures of earth yet no fossils are visible, so unlike those sites with the “snails” etc you only see the rocks and you can touch anything you want, although you shouldn't touch anything but the examples. I met a hiker on the way and he confirmed my findings that everything is off-limits aside of staying on the road. He tried to hike the area but people would ask him what he is doing. The private game reservation is probably the biggest shock and they have for sales signs on the fence. If you ever wanted to own a piece of South African world heritage here is your chance. On the other hand, as beautiful as the park is the main feature for the world heritage listing is seen on the geotrail. The listing is still too recent apparently as there was no UNESCO sign and no plaque along the trail. The whole trip took less than 3 hours so I didn't stay in Barberton and instead drove on to save time. With the lack of hikes I find the area very lacking of entertainment. Whereas I didn't find it very boring and they are trying hard to make geology interesting, I didn't quite grasp what some of the signs meant and I just find the rock formations interesting. The small sites make it difficult to park if there is another car parked there already, although I didn't run into anyone on the way. Lasty, the scenery is stunning so I have to give it some extra marks. I can't fully recommend it but maybe you can attach it to a visit to Kruger.